An erebid moth seen sipping the tears from the eye of a black-chinned antbird. There are actually two parasites on this poor bird—notice the mosquito on its chest. In an oddly poetic act, moths will on occasion drink the tears from the eyes of a sleeping bird. Sounds harmless, but this rare interaction is an unmistakably one-sided affair. Scientists actually have a word for this unique tear-feeding behavior, which they call “lachryphagy.” To feed in this way, moths gently insert their straw-like proboscis into the eyes of their unwary hosts, sucking out the nutrient-laden tears. Scientists have watched moths drink the tears from various mammals, and even reptiles like turtles and crocodiles. But on birds, not so much. A new study published in Ecology is now just the third to document lachryphagy involving tear-slurping moths and their feathered hosts, the other two cases being in Madagascar in 2007 and in Colombia in 2015. 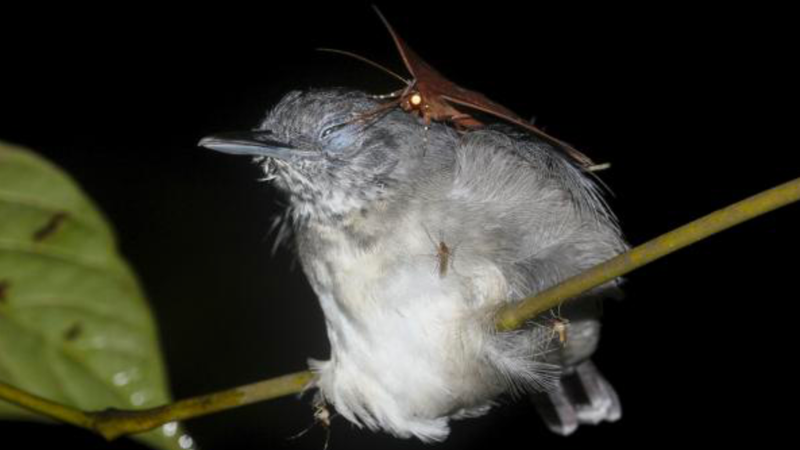 This third documented case of moth-on-bird action was observed by Leandro João Carneiro de Lima Moraes, a biologist from Brazil’s National Institute of Amazonia Research, while conducting field work near the banks of the of Solimões River in central Amazonia. Just before midnight on November 7, 2017, Moraes saw an adult female black-chinned antbird resting on a branch. Later that same night, Moraes witnessed a similar scene involving a different bird and moth, both belonging to the same species as before. In both cases, the feeding did not disturb the antbirds as they slept, remaining completely immobile as Moraes watched. As they fed, the moths rested on the neck of the birds, doing their best to avoid waking their hosts. That said, it is surprising that something so seemingly intrusive doesn’t disturb the antbirds. In his paper, Moraes says their immobility is likely the result of the birds entering into a state of torpor while they sleep at night. In this inactive state, their metabolism drops dramatically, as does their body temperature. For the moths, the benefit is clear. The tears are filled with nutrients, such as sodium and proteins, namely albumin. The tears serve as a supplement to the moths’ diet, improving their flight performance and reproductive chances. Moraes says the sodium is a particularly valuable nutrient for the moths as it’s difficult for them to find it elsewhere in the region, which is susceptible to flooding. The rarity of this event suggests moths don’t seek out birds very often, but Moraes says more observations are needed to be sure.